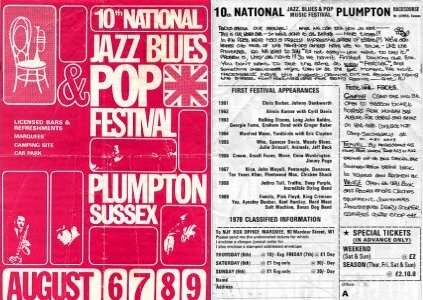 "10th National Jazz, Pop, Ballads & Blues Festival"
Yes deserve all the credit that colleague Welch has been showering on them for the past two years. For me they were a highlight of the night. 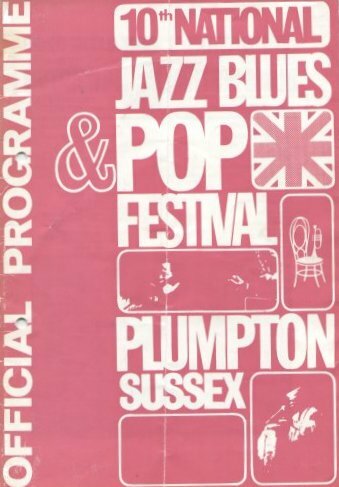 Their rehearsals down in Devon have proved their worth and they emerged as one of the best bands in Britain. Jon Anderson, eagerly tapping a cowbell, encourages the most from his musicians. 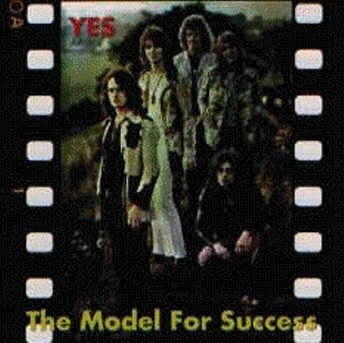 New guitarist Steve Howe did a lovely acoustic solo with his self penned 'Clap' and the group reached a tremendous climax on 'America'. 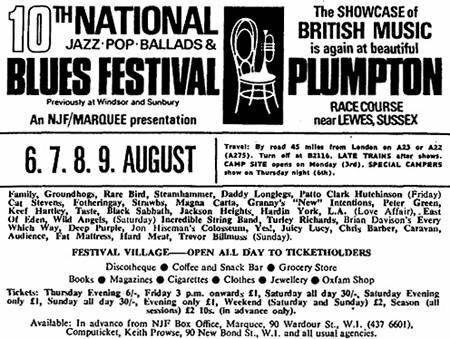 I was at Plumpton in 1970 and had a really good time, perhaps because it wasn't such a big event as the IOW which followed a few weeks later. All the practicalities mapped out and there were no births or deaths or mass invasions of police so you could really relax in a peculiarly British type of way. 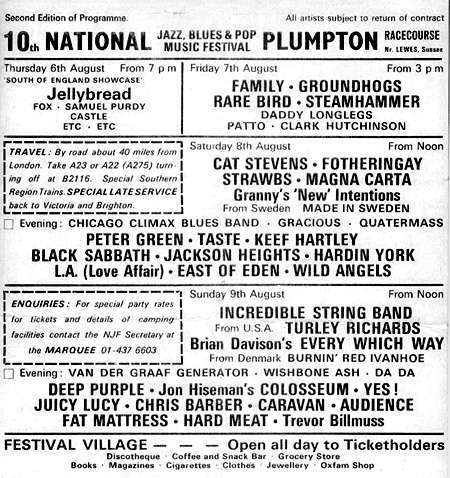 Although many of the bands were third and fourth division at the time there were some excellent sets from bands that went on to be mega (Deep Purple, Black Sabbath etc). 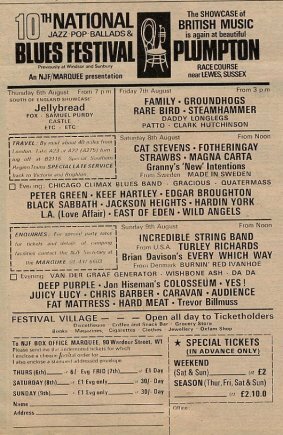 I remember the Groundhogs, Family, Fotheringay and Yes as particularly impressive. 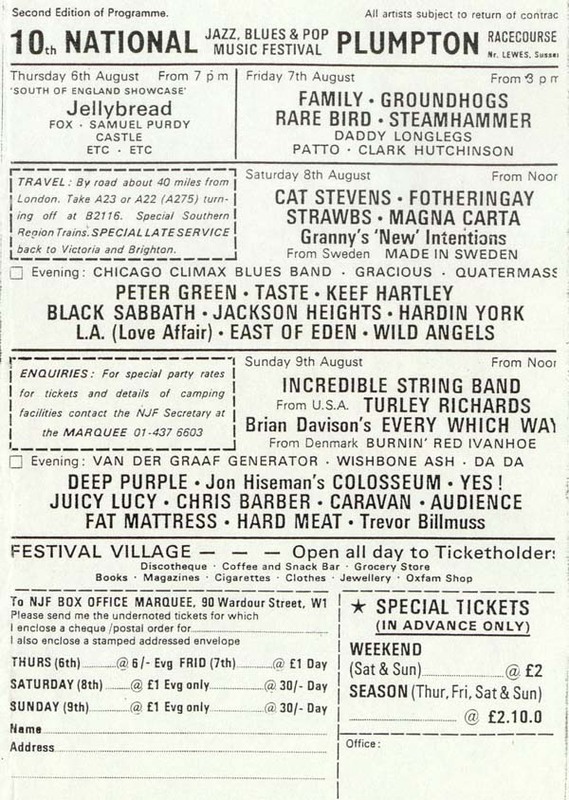 Yes played at around 7.30 on the Sunday in chilly but clear weather and people took the wooden chairs from the press area and made a bonfire about 30 yards back from the stage. Jon Andersen was in great voice and the evening turned into one of those glad to be alive experiences. 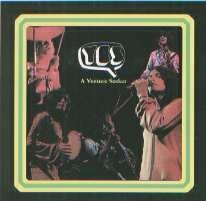 "The 10th National Jazz, Pop, Ballads & Blues Festival"
We're going to start off with a song from..uh our second album which is on release now in thousands of shops. It's a nice evening isn't it? We're going to do a song called 'Astral Traveller'. So here we go. Thank you very much. Here's a song that we want to do called 'I've Seen All Good People' and today..uh well this evening we did. It's really nice to be here. Thank you, thank you, thank you. Steve..uh our guitarist, re..recently joined us. We have many a happy hour playing in Devon listening to his..funky guitar, funky guitar playing and here's a song he used to play to us to send us to sleep by or send us on our way to sleep and this song he calls the 'Clap'. I think, I think maybe we'd better dedicate the next one, set of two fine gentleman who want a lift to..uh Scotland. Hope you have your railway tickets. Just tell them that we can give them a lift to the Charing Cross Road [???]. Well those bonfires are out. Well the most beautiful songs that..uh Simon and Garfunkle have actually written..uh Paul Simon has written. This next one is our favorite and we hope you all like it. It you want to sing along please do. [???] It's called America.